We choose our Portuguese translators (who are all professional linguists) based on the country you need your translation in. This gives you the most naturally suited translation for a range of documents in various industries. We can translate your document into European Portugese or Brazilian Portuguese, depending on the region/dialect you need. Apart from Portugal,European Portuguese is also used in the Atlantic islands of Madeira and the Azores, both posessions of Portugal. The ex-posession of Macau off mainland China also uses European Portuguese. The difference between the two written forms are very small and only relate to slight differences in spelling regarding accents, eg: sinónimo, where the Brazilian has a circumflex accent; sinônimo, and where the Brazilian spelling often lacks c or p before c, ç, or t, for example: Brazilian fato with European facto, meaning "fact". The written Portuguese in Macau (China) is very similiar to European Portuguese. European Portuguese is used in these African countries (see right), although for lower skilled workers, it is mostly mixed with Creole. 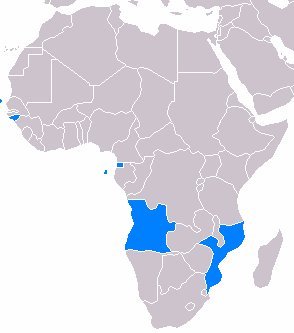 Angola, Cape Verde, East Timor, Equatorial Guinea, Guinea-Bissau, São Tomé and Príncipe and Mozambique. All our Portuguese translators, whether translating from Portuguese to English translation or English to Portuguese translation are qualified translators with over 5 years and 500,000 words translated in their specialised field. The vast majority of them hold the diploma in translation (diptrans) from the Chartered Institute of Linguists or its national equivalent and have made their careers and professions out of translating in their specialised subjects which they hold a degree or extensive background. Why use us for your Portuguese Translation? • Use our translation quote calculator to get an instant translation quote for your Portuguese translation. Will your Portuguese translation be the same amount of text? No, see the example below. In general the text translated from English to Portuguese will expand by about 20%. Conversely, your Portuguese to English translation text will contract by around 20%. Todos os seres humanos nascem livres e iguais em dignidade e direitos. São dotados de razão e de consciência e devem agir em relação unos aos outros com espírito de fraternidade.